Graffiti are a very common and old form of street art. They abundantly appeared in Ancient Egypt, Greece and Rome where they were mostly a way to publicly proclaim admiration or express dissatisfaction. The contemporary graffiti culture emerged in the late 1960’s with the emergence of aerosol paint: the famous graffito that sparked interest in spray-painting walls with messages appeared in 1967 at a station of the London Underground. It read “Clapton is God”. 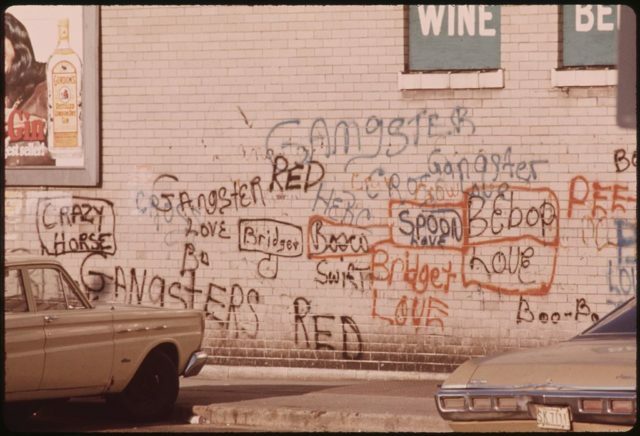 Since the late 1960’s, graffiti became a vital part of urban culture. On several occasions cultural movements were started by people who wanted to spread their message and used graffiti to publicly express their opinions. 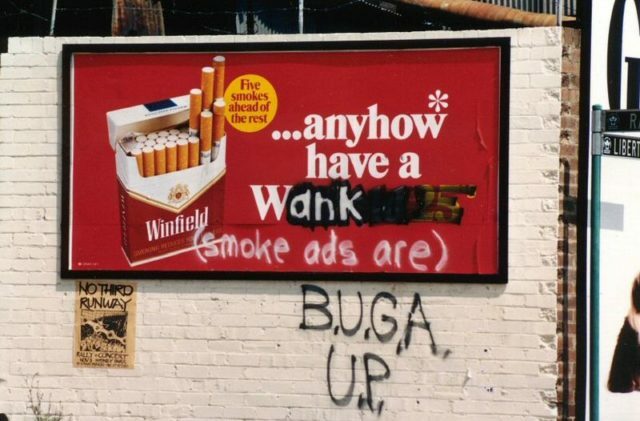 One such movement is the Australian BUGA UP, an acronym for “Billboard Utilising Graffitists Against Unhealthy Promotions”. 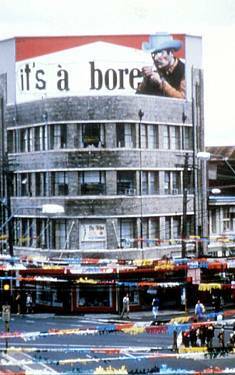 The movement started in October 1979 in Sydney, when artists Bill Snow, Ric Bolzan and Geoff Coleman decided they were fed up with advertisements for unhealthy products, and started a war against such advertisement policies. They coined the acronym together and began altering billboards and public advertisements to spread their idea of healthy living. The peak of the movement’s activity was during the 1980’s, when it quickly spread across Australia, and soon across the world. The movement remains active today, but it is not centralized and doesn’t have an ideological leader: graffiti artists which choose to warn the public against unhealthy promotions often write “BUGAUP” next to their graffiti to show their appreciation of the original group. The movement originally targeted billboards that advertised cigarettes and alcohol, but they soon started attacking other products they considered unhealthy, like Coca-Cola and other soft drinks, pharmaceuticals and fast food. Their trademark was altering billboard slogans into satirical messages that criticized the product instead of advertising. This form anti-advertising is known as “subvertising”, and remains popular all over the world. Some members of the BUGA UP movement were esteemed citizens, and some ended up having extensive and prolific political careers and were praised for their activism. Most notably, Arthur Chesterfield-Evans, a prominent South Wales politician, was an active BUGA UP activist prior to entering politics. One of the most prominent members of the original BUGA UP movement was Rolo Mestman Tapier, known as “Lord Bloody Wog Rolo”, who joined the movement in 1981. 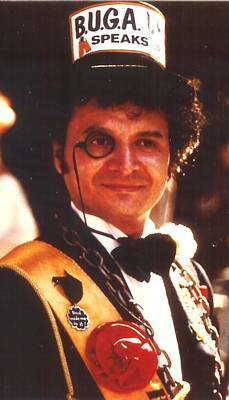 He was known as an eccentric persona whose activism was often so radical that he was a target of police harassment throughout his life. 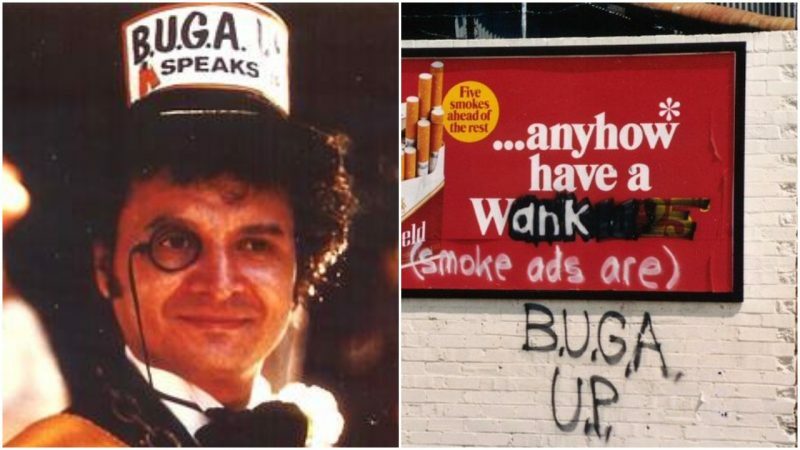 Still, Lord Bloody Wog Rolo’s involvement in the BUGA UP movement resulted in some changes in the Australian law that minimized the advertisement of tobacco products. Namely, Rolo noticed that many supermarkets across Australia sported shopping bags that promoted cigarettes. His public health awareness campaign resulted in tobacco products being banned from appearing on shopping bags, shop windows and posters around supermarkets.